Mary Ann Flunder, long-time KCKCC Board of Trustees member and mentor to many, dies – Welcome to Wyandotte Daily! Mary Ann Flunder, 82, a member of the Kansas City Kansas Community College Board of Trustees for about 25 years, died March 24. A visitation is scheduled from 5 p.m. to 8 p.m. Thursday, March 31, at the Kansas City Kansas Community College gymnasium, 7250 State Ave., Kansas City, Kan. A Mass of Christian Burial will be held at 11 a.m. Friday, April 1, at Our Lady and St. Rose Catholic Church, 2300 N. 8th, (8th and Quindaro), Kansas City, Kan. Interment will follow the funeral service at the Leavenworth National Cemetery, Leavenworth, Kan.
A well-known civic leader, Flunder was best known for her interest in advancing educational opportunities for children and residents. Her past service includes the national Association of Community College Trustees and the Kansas Association of Community Colleges, where she was a past chairperson. She was well known in the community for her enthusiasm about education and senior citizens’ issues. Just several years ago, it was not unusual to find out that she was flying to Washington, D.C., and going to Topeka, Kan., to lobby to help community colleges and students. She also was active in several local educational efforts, including one that provided more math and science education to younger students. She was named to the Reasons to Believe Alumni Honor Roll in 2012 of the Kansas City, Kan., Public Schools. She also promoted senior citizens’ rights, and was a past speaker pro tem of the Kansas Silver-Haired Legislature. She also was active in the Kansas City, Kan., Northeast Optimists and is a past president of the Kansas Federation of Democratic Women. She also served on the board of the Kansas City, Kan., NAACP and was past membership director of Kansas Black Chamber of Commerce. Flunder helped children and families at the Economic Opportunity Foundation for 20 years. 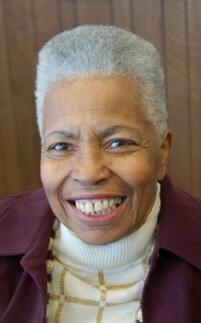 She also was the director of the minority affairs office from 1985 to 1992 at the University of Kansas. She served as executive director of Turner House from 1973 to 1975, starting a nutrition site for senior citizens and a center to help school dropouts. She owned a small business, Flunder’s Groceries, with her family from 1967 through 2000 in Kansas City, Kan.
Flunder attended Sumner High School, KCKCC, Donnelly College and the University of Kansas. She was a mentor for several persons, including Richard Mabion, president of the Kansas City, Kan., NAACP. She was a person that one could sit down and talk to and get some advice from, he said. Donations may be made to the KCKCC Mary Ann Flunder Scholarship Fund. Thatcher’s Funeral Home is in charge of the funereal arrangements. What a tremendous role model. One thing she ALWAYS had time for was ensuring young folks could afford and stay in school. Especially, disenfranchised. She gave them a voice when often no one else would. Thoughts and prayers to the Flunder family, with great sympathy. A great woman and mentor to many. I worked with her at the Economic Opportunity Foundation in the 1970’s. Her energy and dedication to human service causes was a force of nature. Jessie, you can be very proud of your Mother’s lifelong accomplishments! Not knowing her personally, she was a person of action from all I have read. She managed both a family and a career both that require a whole bunch of caring. I wish you and your family my best at this difficult time. God Bless her and your family. See you soon! She was such a great help in my search for college choices. It will be a great loss of such a influential person. She will be missed but never forgotten. Mary Ann…it seems that you made everyone feel like they had a special relationship with you…I guess that’s because they did. I know I felt as if I had a special relationship with you because of the many times you and I talked and traveled mostly to some meeting here locally with in a (200 mile radius… lol) or over to someone’s house to inform, give, support, or do the work for them to receive a benefit… I remember when my mother went home to be with the LORD you came immediately and took my hand like a big sister, and I was so impressed that I joined or became involved in almost everything you were apart of, man that was so many organizations and met so many people… and you never let go of me and I never let go of you until now… however I think sometimes I hear you calling my name “THOMAS” during my quiet times when I think about you. I just can’t put all my memories’ of you on paper, when I think I’m done more come about. I suppose you’ll always be with me spiritually. I will miss seeing Mary Ann at our quarterly Kansas Association of Community College meetings. She was a strong advocate for community colleges and her voice will be missed. Mary Ann was a mentor for me when I was serving on the KCKCC Board of Trustees from 2005-2009. She became a dear friend in the short time that I knew her. The last time I saw her was at a revival at Our Lady and St. Rose on March 14. She was not feeling well, but she still gave me a radiant smile—the one she always gave me when she called me by her pet name— “Hernandez.” I will miss her, but I know deep in my heart that she will be praying for me and everybody else whose life she touched while she was still on this earth. May she rest in eternal peace until we meet again. Mary Ann was always exciting to be around. Her candor and commitment to KCKCC and its students was inspiring. Mary Ann it was a pleasure working the Elections with you through the years..REST IN PARADISE..You will be missed…??? To my Dynamic Hero of The Neighborhood Coalition Groups, NAACP, Northeast Optimist Club, Precinct Committee Guru, Election Board Districts Ambassador, My Watkins Lady, PrePaid Legal Diva, Democratic Clubs of KCK Matriarch, Fellow Roommate, KCStar Paper Lady,KCK Community College Trusteeship, Please let me not forget- Match maker. I will always love and miss you. I can hear you saying OK now Mabon leave something for the Obituary. Mrs. Flunder my sparring match partner is gone, You taught me to reach for the Stars and that no obstacles in life were too big or to small, To attain the Victory. Rest in peace Mrs. Mary Ann Flunder you were an extremely amazing servant of your fellow man. Well Done. No one had greater commitment to the community than Mary Ann. It was my blessing to be her pastor for 16 years –- what an inspiration she was to me! It will take many people working together to fill her shoes, but isn’t that what she would want –– folks working together? Well done, good and faithful servant! My heartfelt prayers and expressions of hope to her family and to her Church family, and all who loved and served with Mary Ann. Next Next post: Legislative update from Rep. Pam Curtis, D-32nd Dist.